Daniel Halsey is a certified permaculture designer and teacher for multiple academic institutions and organizations. Daniel graduated from the University of Minnesota with a Bachelor of Science degree in Temperate Climate Polyculture Design and is currently a graduate student working on a Horticulture Masters degree (Graduating Fall 2012). His interest in agro-ecosystems and edible forest gardens began with an introduction to polyculture design in 2003. Polyculture plant systems are patterned after forest ecology where each plant contributes to the health of the ecological niche and soil community. Dan travels nationally, hired to design and consult for planning of intentional communities, agro-ecosystems, and broad-acre restoration. 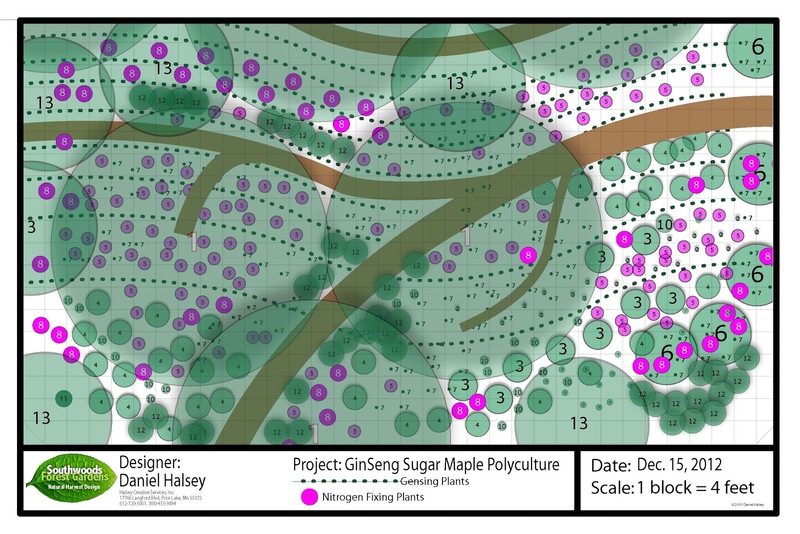 Dan is currently consulting and implementing his Perpetual Harvest Community Garden designs. 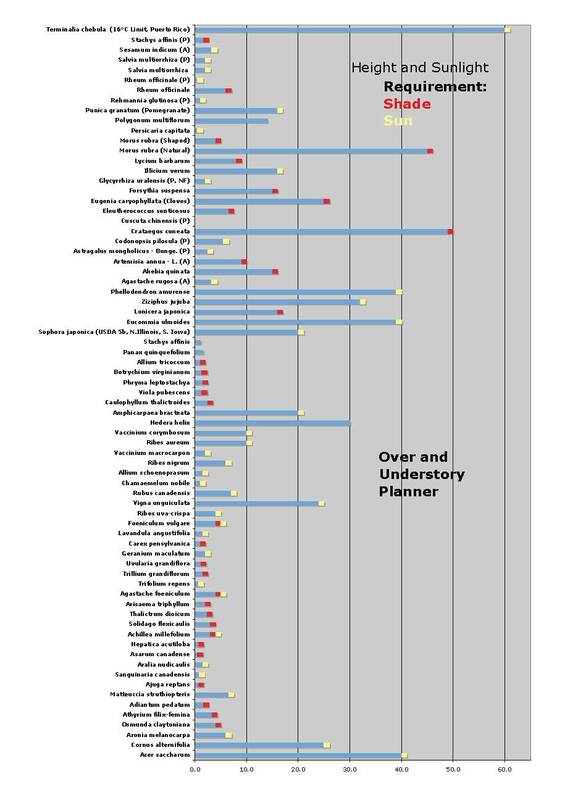 The majority of his master plans are for large-scale agrarian community systems supplying multiple yields and resource cycling. Dan and Ginny live on a twenty-five acre wetland savannah called SouthWoods, in Prior Lake, where they have manage self-sustaining forest gardens of fruiting trees, shrubs and nut crops. 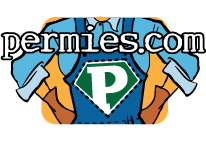 SouthWoods incorporates permaculture principals in all aspects of living. I am not sure what you mean by that. Affluent Access. The database? Books? The database is free unless you want other services. Authors have to eat too. Have you tried the analog method or build a guild method? There is a the database we have that assists people in developing resource guilds. The Natural Capital™ Plant Database is a repository of temperate climate plant information for ecological design. Our partner designers have combined the best sources of plant research and documentation in order to provide the highest integrity for a wide variety of users. Whether you are a first-time gardener or an experienced permaculture designer, we hope you find the information you need to take your knowledge of plants and ecological systems to the next level. We use citations from multiple sources and provide detail on plant characteristics, tolerances and behaviors, ecological functions, human uses, concerns, and plant associates. I think with works from Martin Crawford, Dave Jacke, and our book, Integrated Forest Gardening, there is sufficient definition and models for understanding the forest garden model. Plant guilds are well defined groups of plants with integrated mechanisms for facilitation (I hope that is not too many syllables); whereas Food Forests is a vague reference to woody agriculture. These are grouping of polyculture plant guilds. This is polyculture guilds for terraces. The proximity, structure, and the ecological services define the plant guild's properties. I think it is a graphical representation you are looking for. Keep the scientific manes in a Key and witness the shape and placement of the plants that create resource sharing and partitioning. SouthWoods is looking for an experienced and educated individual with high energy, horticultural aspirations, and agrarian goals. The position entails managing the existing operations and assisting in developing additional site resources (small livestock, Chinese medicinals, and hoop house plants, etc.. The selected individual will also be instrumental in opening a wholesale/retail permaculture plant nursery, assisting in permaculture workshops, site assessments, design, and implementation. Some travel requiring a passport may be involved. This is a residential arrangement with the manager/apprentice living on-site with private entrance, room and bath. A portion of the taxable compensation is traded for lodging and meals. Weekly hours of work will range from 20-40 depending on seasonal circumstances. This position is part administrative and part farm labor with opportunities for additional wages at higher rates with experience. Compensation commensurate with experience. Minimum six month commitment. Proficiency in all Microsoft Office programs required. GIS, CAD, and graphic design experience a plus. 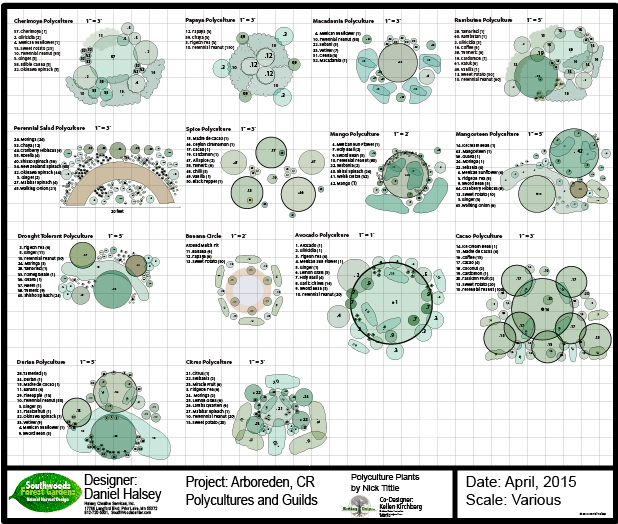 Permaculture design certification expected prior to or within six months of employment. Proficiency in horticultural principles, extensive gardening, or farming history required. Assist and initiate management practices in all aspects of the landscape. Keep records and journal of all activities. Research, discuss, and apply better management practices for livestock, plant propagation, forest stewardship, water catchments, nutrient cycling, crop harvesting and storage, and human uses from plant systems. Care for the household, facilities, buildings, appliances, machinery, outbuildings, living quarters, classroom, and property in general. Cook, clean, and apply sustainable practices in daily operations of the household in all aspects of personal life. Support and develop nutrient cycling systems, build natural capital, and increase energy conservation. Interviews will be conducted in October or until the position is filled. See southwoodscenter.com for other information. Abstract: When individuals first learn about a new plant, many of them immediately are excited to have the plant in their landscape and look for a source of seeds and/or transplants to do so. What’s missing in many of these limitations is the fact that all plants grow in ecology of companion plants. The niche in which a species grows is filled with other plants that support it and the soil ecology. Taking a plant out of its natural environment and isolating it in pots or planting beds removes it from the supporting mechanisms that facilitate its growth. This is followed by reduced yields, disease, and reduction of the phytonutrients it might supply to its consumer. Cultivating these plants within a supporting ecology where all ecological functions are present and filled by plants with those functional roles may seem to reduce the yield, except for the fact that yields in aggregate of all the associated plants far exceeds that of the one. Building a forest polyculture of any kind requires a considerable amount of planning and many sources of material to research the niche and species available to deliver human uses and ecological services. 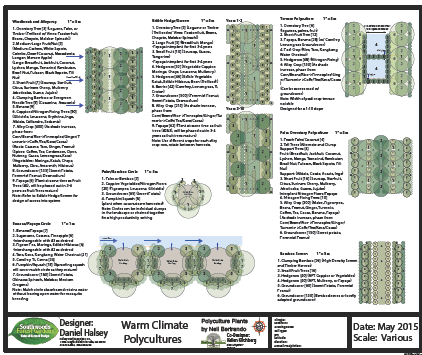 Keeping the final plant list to a minimum for the initial placement of the ecologically functioning species will help build a functional structure. After the initial 9 to 12 species are in place, including the over story, a number of shrubs, companion perennials, and a groundcover species, other plant species can be added. Combining Chinese medicinal herbs into an existing ecological system of natural plant Associates increases the diversity of plant species, but also the disturbance regime frequency. If human harvesting is increased in the forest poly culture, ecologically supportive plants should also be increased. Nitrogen fixers, dynamic accumulators, and nurse plants will mitigate the removal of nutrients. It should be suggested that small patches of plants be implemented and studied prior to any large change in a forest ecosystem, that being said, the forest plants should be augmented with increased diversity, but still had a much smaller proportion than what already exists. Please note: Some feedback I have received about the invasive nature of some species is based on local conditions. The structure of the polyculture can be used for many species and as always, all solutions are site specific. No native plants were harmed in the implementation of this polyculture. 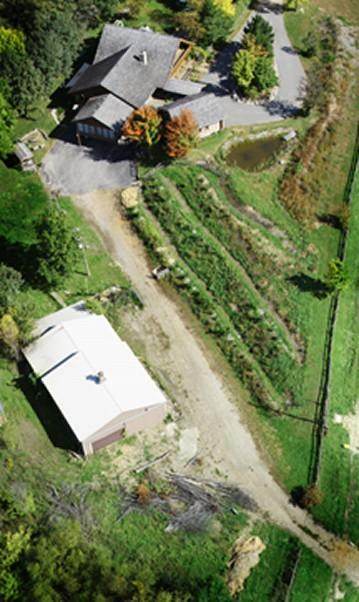 January Homestead and Permaculture Design Intensive 2 seats left! Go to : http://southwoodscenter.com/Urban_Design_Series.html for more information and to register. Large or small, our landscape is filled with possibilities. Locked in your property may be the means to sustain an abundant lifestyle for growing your food, collecting fresh rain water for drinking, and reducing your dependence on purchased resources. This series will unlock the ecological capital that abounds within your yard, fields, or the neighborhood that surrounds you. It will give you the skills and foresight needed to assess, concept and design your property into a perpetual harvest garden and low input living system. Learn ecological landscape design language and technique while using the permaculture design process to create a ecologically balanced residence and abundant lifestyle. Small intensive design classes are limited to 12 tables. Register early. Classes will be held at SouthWoods in Prior Lake, MN. See details below. Any class can be taken individually, however the Homestead Design series is a progressive learning format building from all sessions. The Assessment workshop and Homestead Design Series will culminate with each participant completing a personal homestead design ready for implementation. Make sure you keep time available outside of class to complete the assignments. Limited tables so design classes are limited to 12 people. Refresher or Returning Alumni, Individual Classes $25.00, as space allows. Class 5 is a final design workshop finishing the concepts with plants, materials, and final critique. The final steps to a sustainable design: Plant Selection, Ground Covers, Material Calculations, Implementation Notes and Logistics Demonstration: Plant Database Queries and Internet Resources Urban Design student materials list is provided below; some items will need to be purchased at a specialty art or office supply store. Design kits may be rented during the course. Materials List T-square 36”, Drafting tape, Triangles: 45-90 degree & 30-60 degree, Scissors Compass, Drafting pencils – HB, B, 2H, 4H, 8 Scale Ruler, Large and Small circle templates, Tube for carrying drawings, 8-scale graph paper; sheet size 24” x 36” (approx. 4 sheets), 24'x36' vellum paper , -2 sheets Bum wad paper, Glue stick or double-stick tape, Eraser, Black ink pens – minimum of 3 tips: narrow, medium, bold (This is included in the rental fee).